On December 21, 2017, MSC Cruises’ newest ship—the MSC Seaside—became its first christened in the United States. 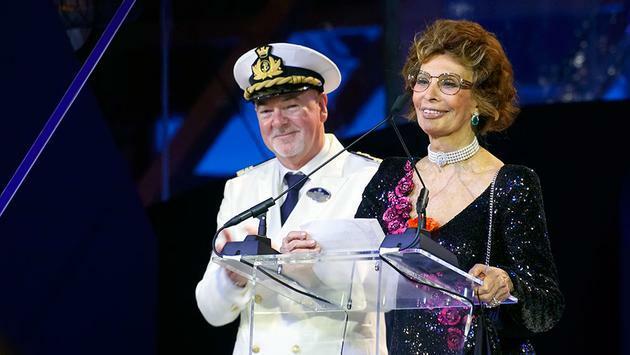 Italian film actress and godmother Sophia Loren named the ship in Miami, Florida amid other exciting celebrity appearances and performances. I was there with international media, special guests, Miami authorities, travel partners and MSC employees to cover it all. “MSC Seaside has been designed to spearhead the next phase of our growth in North America, a cornerstone of our global strategy,” said Pierfrancesco Vago, MSC Cruises’ Executive Chairman, in a press release. Loren has served in the capacity of godmother for every MSC ship since 2003. Once again, she cut the ceremonially ribbon—releasing a bottle of champagne, crashing upon the hull for good luck. Joining her for the evening event was famed tenor Andrea Bocelli, also representing the cruise line’s Mediterranean heritage with rousing operatic singing. He treated us to such classical numbers as “Ave Maria,” “Amazing Grace” and his signature “Con te partiro” with backing by 30 children from the Voices of Haiti. In fact, it was newly announced that MSC is partnering with the Andrea Bocelli Foundation in support of the charity’s work in impoverished Haiti. Guest donations from onboard the Seaside will go to help fund schools (that also serve as community centers) and projects like the Mobile Clinic. The latter provides health care and clean water, plus lighting and agricultural development. “MSC Cruises has always supported philanthropic projects and, in line with this tradition, MSC Seaside’s naming today marks a further inauguration: the launch of the partnership between MSC Cruises and the Andrea Bocelli Foundation,” said Bocelli, in the release. Another collaboration with award-winning restaurateur, author, and TV personality Joe Bastianich was also recently revealed. He will craft an exclusive dish for the MSC Seaside to be showcased on the Elegant Night menu. This adds to the cuisine already featured from celebrity chef Roy Yamaguchi. While the Seaside was constructed internationally, it is MSC’s first to be purpose-built for the North American market. Naturally, invitees reflected the ship’s new home as well: Actor and TV host Mario Lopez was master of ceremonies, opening the event with “blue carpet” celebrity interviews, photos and meet-and-greets with the gathered crowd. Besides Loren and Bocelli, Lopez also hosted a special appearance by Miami football legend and Hall of Fame quarterback Dan Marino on stage. For 17 years, the athlete played for the Miami Dolphins—the team MSC partnered with as official cruise line in October 2017. Sports fans will have the opportunity to experience the Miami Dolphins by meeting team alumni onboard a Seaside theme cruise in 2018. The headliner, however, was global superstar and Miami favorite Ricky Martin. The popular Latin musical artist energized attendees with a performance of such hits as "Livin' la Vida Loca." If all of that were not enough, the grand finale was a massive fireworks display over the newly inaugurated MSC Seaside with the Miami skyline brilliantly lit behind. After all, the architecture of the ship intentionally blends in perfectly with the metropolis thanks to its condo-like stateroom and suite tower rising dramatically above the stern. 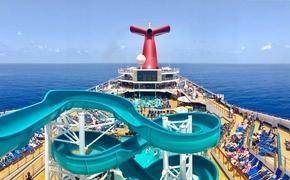 The ship is poised to be a game-changer for not only MSC Cruises but Caribbean itineraries overall. Most remarkable is its connection to the sea itself, complete with abundant glass enclosures and ample outdoor deck space unlike the industry has seen before. It has been a privilege for me to personally witness this ship in all of its phases—under construction, launched from the shipyard and currently christened. I can’t wait to first try and share its al fresco experiences in its now warmer surroundings.